Thanks for stopping by the blog today. 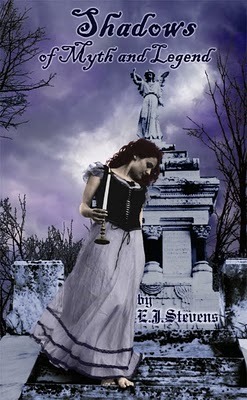 I’m chatting with E J Stevens, author of She Smells The Dead, today. I will have a review of the book up later today and a chance to win a signed copy next week. Diva: Describe E J Stevens in five words. E J: Eccentric, goth, witty, convivial, vivacious. Diva: When did you start writing and why did you decide to write paranormals? E J: I had an unusual childhood steeped in the myth and folklore of the British Isles where my mom enjoyed her youth. My favorite childhood diversion was to create and tell haunting stories filled with the magical, and often monstrous, paranormals that my mother's tales inspired. In elementary school I began to put pen to paper and discovered an aptitude for writing. I have been composing verse and weaving prose ever since. Diva: What three things do you have to have while writing? E J: Caffeine, caffeine, caffeine! Actually I am at my most creative when deep in the magic of the forest where I live with my corgi companion at my side and my writing implements at hand. There is that wondrous moment when, with an artist's eye, you find the perfect slant of sunlight through the trees, a cluster of mushrooms growing from a bed of lush green moss and you know that when you blur your eyes you will be able to see the wee folk and the shadow spirits dancing in the periphery. Of course, without an infusion of caffeine the magic could all dissolve with a yawn and the moment wasted with a nap. Diva: Your new release, She Smells The Dead came out in August and has been getting rave reviews. What was your inspiration for writing the story? E J: This was one of those magical moments. I was walking by the overgrown graveyard near my home and was suddenly overwhelmed by a strong unusual odor. I then wondered what it would be like having the paranormal ability to sense spirits of the dead through smell rather than by sight or sound. I felt so inspired that Yuki and her friends were born that very day. Diva: The book is the first in the Spirits Series, how many other books are planned? E J: There are currently plans for four books in the series, however, this is subject to change. The second book in the Spirit Guide series, Spirit Storm, is due to release in early 2011. Diva: Who are some of your favorite authors and what's on your To Be Read shelf? E J: I am a fan of Kim Harrisson, Jim Butcher, Maggie Stiefvater, and Neil Gaiman and have an unhealthy obsession with Edgar Allan Poe. At this moment I have 2,229 books on my Goodreads to-read shelf. The books currently at the top of my tbr pile are The Haunted by Jessica Verday, Unholy Ghosts by Stacia Kane, The Agency by Y.S. Lee, Glass Houses by Rachel Caine, and Clockwork Angel by Cassandra Clare. Diva: What's your next project? E J: I am finishing work on Spirit Storm, the second book in the Spirit Guide series, which will release in early 2011. I also have a work in progress, Shadows of Faerie, my third collection of poetry. E.J. Stevens is a graduate of the University of Maine at Farmington with a Bachelor of Arts in Psychology. She has worked a variety of jobs that demonstrate the human condition including schools, psychiatric hospitals and (*shudder*) shopping malls. E.J. currently resides in a magical forest on the coast of Maine where she finds daily inspiration for her writing. E.J. 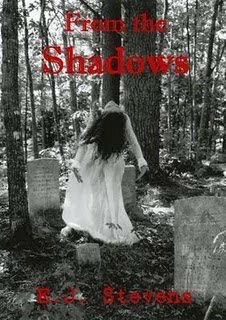 Stevens is the author of the haunting collection of dark poetry FROM THE SHADOWS, the chilling collection of paranormal poetry SHADOWS OF MYTH AND LEGEND, and newly released novel SHE SMELLS THE DEAD the first book in the Spirit Guide young adult paranormal romance series. Love your 5 words E.J.! Always a joy to hear the inner workings of a talented writer. Great Interview Diva and E.J. You're welcome, thanx for taking the time to answer my questions. And wow, that's a lot of books!